Rescuers carry a survivor from inside a collapsed mine in Bolaang Mongondow, North Sulawesi, Indonesia, Wednesday, Feb. 27, 2019. The collapse of an unlicensed gold mine in Indonesia buried dozens of people, and rescuers dug desperately with their bare hands and farm tools on Wednesday to unearth victims calling for help from beneath the rubble. 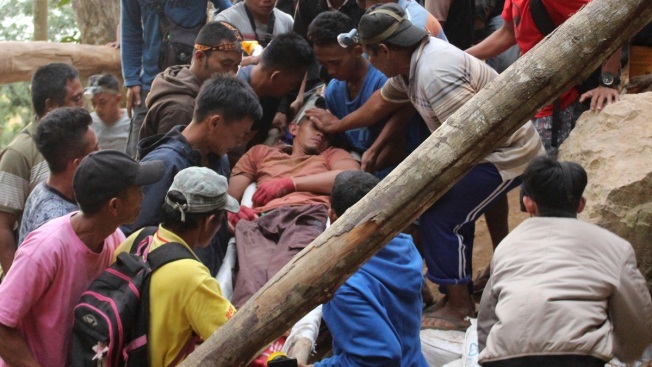 A grueling search and rescue effort has saved 19 people from the debris of a collapsed illegal gold mine in Indonesia's North Sulawesi province but officials said Wednesday that several dozen remain trapped.